I’m thankful that Lehigh Valley is home to quite a few restaurants that hold some of my favorite Jewish meals. We have matzah ball soup and pastrami sandwiches that could give any Jewish deli a run for its money. With the start of Hanukkah coming up, I’m here to give a shout to some of my favorite Jewish meals and where you can find them in Lehigh Valley. Matzah Ball Soup First up is Carnegie Deli, of course. Located inside Sands Bethlehem, this restaurant has the vibe of an old school Jewish deli. 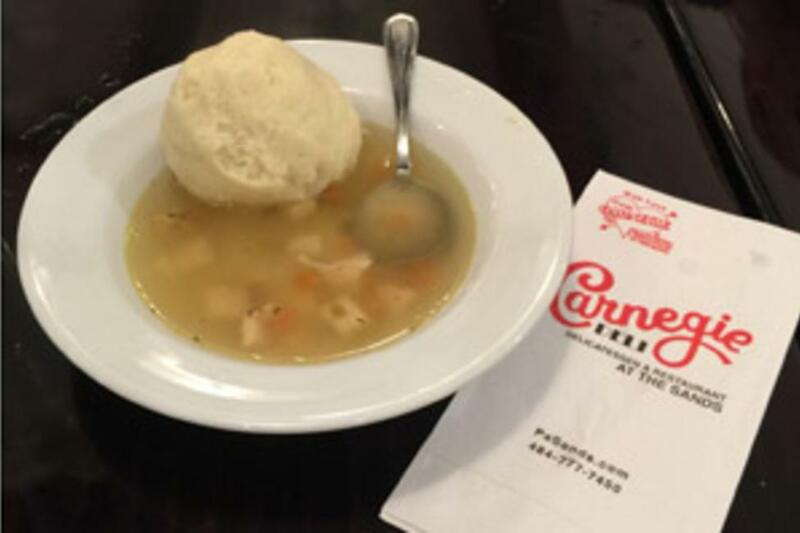 Here you’ll find some of the best matzah ball soup around. Another spot is at Muhlenberg College’s Noshery. Students at the college can use their meal plan but lucky for everyone else, we can still purchase some delicious matzah ball soup at this location. Bagel with Lox My life has been filled with many a bagel. So, you could say I slowly became a bagel snob over the years. To start, you can’t go wrong with the “Towering Lox & Bagel” from Billy&apos;s Downtown Diner. Served with a generous portion of chilled smoked salmon piled high on a toasted bagel with all the fixings, you’ll be a happy camper after this one. If you’re looking for a good bagel with lox “shmear," Johnny’s Bagels & Deli will not disappoint. Throw on a slice of cucumber and tomato and there&apos;s no better meal. Potato Pancakes A Hanukkah tradition for many households is the making of latkes or as some people know them, potato pancakes. While I could go for the homemade ones most days, there are some days that call for a restaurant outing. I would suggest the potato pancakes from Dunderbak’s, Carnegie Deli (or their potato knishes! ), and Wegmans Food Market. Pastrami, Corned Beef, & Brisket Sandwiches My dad is the expert on this one. His vote went to Carnegie Deli’s towering sandwiches. Their pastrami, corned beef, and brisket sandwiches weigh in at over a pound. Syb’s West End Deli is another spot to get all of the above. This is a local Allentown favorite that has a cozy atmosphere and good prices. Hummus, Falafel, & Pita I can’t talk about Jewish food favorites without mentioning everyone’s favorite Israeli meal—hummus and pita. And, why not throw some falafel on there and make it a sandwich? Aladdin and Damascus, both in Allentown, are my favorite places to get this delicious combo. Or, check out Hummus House for their variety of hummus flavors. You can try falafel paninis, sandwiches, or salads that you’ll crave for the rest of time. Well, now that I’m officially starved… I’ll be at Billy’s Downtown Diner which happens to be conveniently located downstairs from our office. Happy Hanukkah everyone! And, be sure to let me know where your favorite spots are!